Yesterday I had the free time (thanks to the Better Half) and the good fortune to attend a new bi-monthly gathering for Our Beloved Game at the Fantasy Flight Games Center in Roseville, MN. I’ve been to many events there, including an Against the Shadow tournament in January 2014 that (I’m pretty sure) crowned MD and myself the reigning World Champions of the competitive LOTR:LCG world. Okay, I jest. Sort of. But the competitive, cave-man side of my brain says that, as far as I know, there’s never been another one, and no one can take away my championship belt. 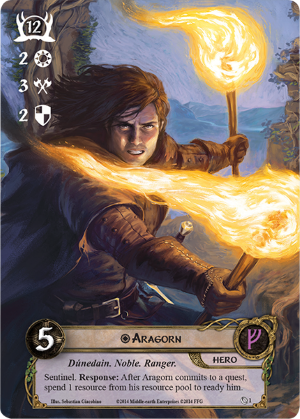 I was only able to stay for about two hours, but that was enough to get in a four-player game of Across the Ettenmoors with Caleb Grace, the game’s current developer, Sean from Cardboard of the Rings, and Matt, an FFG employee. 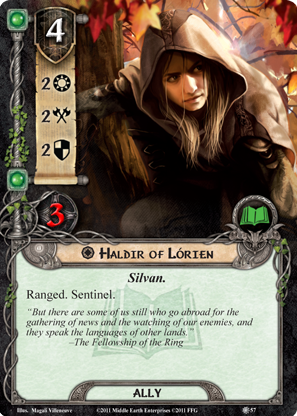 My luck in the past with four-player has not been great, but we just happened to bring four decks that worked really well together: a Silvan lineup featuring Celeborn, Haldir, and Rossiel, a very strong ranged deck that included Eowyn, Legolas, and Beregond, an attachment-heavy deck featuring Treebeard, Elrond, and Gloin, and my most recent deck-craft creation. We absolutely crushed Across the Ettenmoors, which I had never played before. However, after a brief break, the Ruins of Belegost, this year’s Gen-Con quest, destroyed us. We had incredible questing, combat, healing, and cancellation at the table, but no location control, and eventually lost to location lock. However, it was still a blast, and it’s always such fun to play with people who grasp the intricacies of Our Beloved Game. While I won’t be able to make the twice-monthly schedule work for me, my hope is to continue going there as much as I can. While the post this week is short, rest assured that a lot of projects are in the works for Peace and Thought. I’m working on setting up the technical infrastructure to be able to broadcast games on OCTGN, and now that I have my hands on a copy of Keeping Count, generously donated by Sean of CotR fame, look for a review of that soon. Until next time, mára mesta: good journeys!